Arab League head of states addressed challenges facing Iraq, Syria, Libya, Yemen, Palestinians and no mention to Somalia’s drought and famine difficulties. AMMAN — The 28th Arab summit meeting held on Wednesday at the Dead Sea concluded with a message of peace, full support for Palestine and a call for pan-Arab solidarity in the face of challenges. The summit also saw mending of fences between key Arab states. In his closing remarks, His Majesty King Abdullah, who presided over the meeting after receiving the rotating presidency from Mauritanian President Mohamed Ould Abdel Aziz, voiced appreciation for all participants, whom he said have shown keenness to make the summit a “success” in light of the challenges that the region is going through. “We discussed all issues in a transparent manner to come up with several recommendations and resolutions. We will now make all efforts to translate them into reality,” said King Abdullah. His Majesty concluded on the need for institutionalising Arab action to enable “us to overcome challenges that face and that serve our nation”. This year’s summit was attended by heads of 15 of the 22 Arab states, while the remaining were represented by high-ranking official delegations. It was the fourth time for Jordan to host the high-profile gathering since it was first held in 1964. In his opening remarks, His Majesty said Jordan is the closest to the Palestinian cause, noting that Jordanian soldiers sacrificed their lives defending Palestinian land, and that the Kingdom is “aware of the daily struggle of the Palestinian people, Jerusalemites in particular”. He added that the Hashemite Custodianship of Islamic and Christian holy sites in Jerusalem is a historical responsibility Jordan is honoured to undertake on behalf of the Arab and Muslim nations. His Majesty then listed challenges facing the Arab nation and urged active and concrete joint action to overcome them (see official translation of speech on page 3). Amongst other statements, the declaration called on a UN resolution stating that Israel’s settlements have no legal validity, and urged the enforcement of last year’s UN Security Council Resolution 2334. The resolution outlined the continued work for serious and effective peace talks between the Palestinians and the Israelis, renewing the commitment to the 2002 Arab Peace Initiative. The declaration also called for the release of all prisoners, as well as resolving the issue of refugees, in line with the international resolutions in this regard. 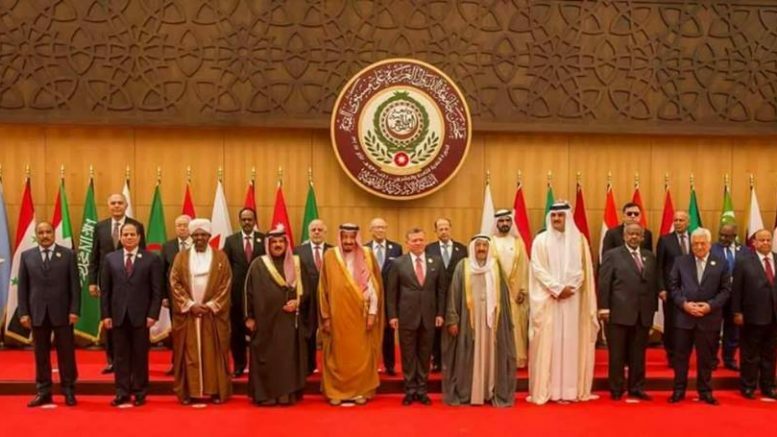 Regarding Syria, Arab leaders agreed on the need to reach a political solution to end the conflict and preserve the unity and territorial integrity of the country. The declaration urged Turkey to withdraw its forces from Iraqi territories, noting that their presence constitutes a violation of Iraq’s sovereignty and a threat to the pan-Arab security. The statement highlighted Iraq’s efforts in uprooting terrorism and praised its work in eradicating Daesh from its territory. Terrorism was pointed out as a common threat to the Arab nation, separate from any religion, and requiring a comprehensive counterstrategy. The declaration also condemned interference in the Arab states’ internal affairs. The Arab leaders decided to task a ministerial committee to work out mechanisms to help countries hosting refugees, focusing on neighbouring nations. The declaration also voiced the leaders’ support to Yemen’s legitimate government, welcoming the organisation of an Arab-European summit for cooperation. “We want peace that fulfils the legitimate rights of the Palestinians,” Safadi said. League Secretary General Ahmed Aboul Gheit underlined “indications that there will be something at the end of April,” referring to His Majesty King Abdullah, Palestinian President Mahmoud Abbas and Egyptian President Abdel Fattah Al Sisi’s planned visit to the US for talks with President Trump. For his part, UN Secretary General Antonio Guterres highlighted the plight of refugees and commended Jordan for hosting those fleeing conflicts during his address to the 28th Arab summit, while bemoaning the fact that developed countries have closed their borders to the region’s displaced. Guterres defined the two-state solution as the only solution to the Palestinian issue, stating that “there is no plan B”. As he acknowledged the “deep sense of despair of the Palestinian people”, the UN chief stressed that “Palestinians and Israelis do not need conflict management; they need conflict resolution”. He also warned of anti-Muslim hatred spread by “populist leaders”, who have increased “prejudice” against Arab and Muslim communities around the world. He bemoaned the “trap of presenting the despicable acts of Daesh or Al Qaeda as driven by Islam, when in fact they utterly defy the faith”, agreeing with Arab leaders that Muslims themselves are the primary victims of terrorism. Guterres urged Arab leaders to shape “a new Arab world”, based on cooperation and dialogue, to address and resolve common challenges. “Divisions in the Arab world have opened the door to foreign intervention and manipulation, breeding instability, sectarian strife and terrorism,” he deplored. Regarding the Syrian crisis, he expressed hope that the Astana process would achieve an effective ceasefire, saying that the UN “will do everything [it] can to enable the Geneva-based political talks to lead to genuine negotiations”. Guterres also welcomed progress achieved by Iraqi forces in retaking territories from the Daesh terror group. The UN chief highlighted the need to address youth unemployment, considering that two-thirds of people in the Arab world are under the age of 30 — “the highest share ever”. (see separate story on page 3). The Palestinian cause constituted the highlight of discussions and the final communiqué. In his remarks, Palestinian President Mahmoud Abbas underscored the need to intensify and coordinate joint efforts to move forward with the Middle East peace process, which should achieve a comprehensive and just peace. Abbas called for restoring momentum to the Palestinian cause, which he described as “the core conflict in the region”. All leaders also agreed on the importance of boosting Arab solidarity in the face of regional challenges, stressing the need for a stronger and more unified Arab action that would help resolve common issues. Sustained cooperation and consultation over regional issues were highlighted as requirements to serve the causes and interests of the Arab nation and its people. During the day, His Majesty King Abdullah hosted a lunch banquet in honour of Arab and world leaders participating in the summit. The banquet was attended by members of the Royal family and senior officials.